The Raven PK1 Knife. Photo: Raven Armoury. Since I was first allowed by my parents to use a Swiss Army Knife 30 years ago, I’ve always been a user of knives. Even though I have had a reasonable number of knives over the years, I’ve never been a collector. It’s not that I have anything against collecting. It’s just that my interest in knives has always been secondary to my interest in the great outdoors. For me, a knife has always been a tool to be used. Of all the knives I own, I have only one that has never been used for its intended purpose. It is a Julius Peterson Woodlore 25th Anniversary Knife, numbered 017 (my birthday is 17th January). It not having been used is largely because when I bought it, I already had two Alan Wood Woodlore knives in use – one standard maple-handled Woodlore and the antler-handled Woodlore instructors knife. I received an email in March 2011 from a friend who makes his living trading high quality knives. He is man who knows his onions, as they say. He suggested that there might be an interesting project afoot, to work with Raven Armoury on a knife for wilderness use. The Raven Armoury mark and sword detail. Photo: Raven Armoury. The work of Raven Armoury is something to behold. Photo: Raven Armoury. I had to admit that I’d never heard of Raven Armoury (sorry Simon! ), and I’m always a little suspicious of superlatives. Nevertheless, I looked at Raven Armoury’s website and photos of their work. I was stunned. Before I’d even met Simon and his team, or held any of their work in my hands, I was convinced that these guys must be some of the finest craftsmen in Britain. Equisite detailing. The team at Raven Armoury are some of the finest craftsmen in Britain. Photo: Raven Armoury. My friend organised for us to visit Simon at his workshop and showroom in April. On meeting Simon, we got on immediately and we talked for several hours about ways in which we could work together. 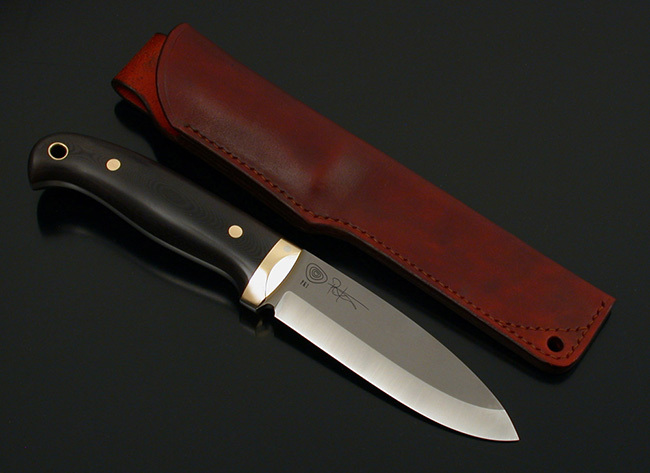 Simon was keen to produce a high-quality, hand-crafted yet robust and practical knife. Raven Armoury receives a lot of commissioned work. Photo: Raven Armoury. Having seen and held many examples of Raven Armoury’s work at their showroom, I can attest to the quality of their work being quite incredible. I was honoured that Raven Armoury wanted to work with me on a project. In terms of design, we were to start with a blank sheet of paper. 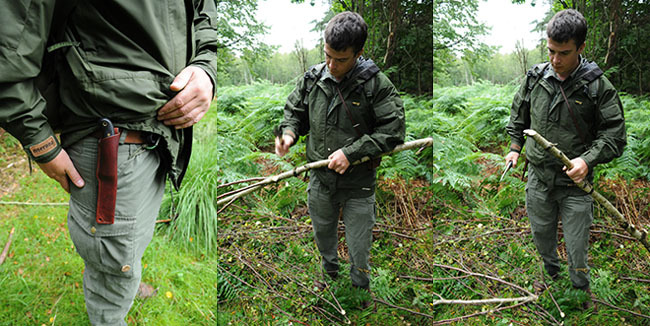 This was a fantastic opportunity for me to design a very practical, extremely robust yet portable wilderness knife that would be made to the highest standards. Humans have been making and using edged tools for millennia and in designing a knife it would have been conceited of me to believe I was going to come up with a practical knife radically different from what has gone before. What I felt I could bring to the project, however, was many years experience of having used knives for practical purposes. Starting with a blank sheet of paper and knowing that Simon and his team would be able to make it was, in some ways, a little overwhelming. I wasn’t sure where to begin. What do I want this knife to be able to do? What failings of knives I have used should I avoid? What features of knives I like do I want to include? At a high level I wanted the knife to be 100% reliable. It had to be very strong. I wanted it to have a go-anywhere design with stable materials that wouldn’t shrink or swell. The knife had to be able to easily attain a razor-sharp edge in the field as well as on bench stones. It had to be able to keep a good edge in the field for an extended period. It had to cut through small diameter green wood (the sort of thing you’d use for in everyday bushcraft for producing pot-hangers, tarp pegs, etc.) like a hot knife through butter. It had to be relatively easy to use to make very good feathersticks for firelighting and it had to generate massive sparks with a Swedish Firesteel. It had to have enough weight behind it and a suitable handle shape for light chopping. Even though it wouldn’t be a specialist carving tool, it had to be handy enough for practical carving jobs such as making spoons and other camp utensils. It had to be useful for small game and fish preparation as well as the skinning and butchery of large animals. This meant as well as having a razor sharp edge, it should also have a curved back/drop point that would allow inversion of the knife for skinning larger game. I wanted the knife to be comfortable in use for extended periods of time. For me this is an area where I spent a lot of time thinking about the shape of the handle. I felt this was an area of bushcraft knife design that could be improved upon significantly. I revisited many knives to examine what was good about the handle and what was not. I wanted the grip to be as comfortable as possible with nothing causing blisters or sore points. I drew together an amalgamation of these observations and sketched out a handle shape. One of my bugbears with the flat-ground bevels on most bushcraft knives is that it is impossible to sharpen all the way along the edge towards the handle. The solution to this was to add a choil. In addition, one piece of feedback I’d heard from people invovled in deer stalking was that it was difficult to maintain a grip on typical bushcraft knives while skinning/butchering large animals, mainly due to lack of profile on the handle or any guard. They always felt that their fingers could slip too easily towards the edge. Simon and I discussed the possibility of adding a guard as an optional extra. We also decided to experiment with a choil large and deep enough to accommodate the index finger of the user. An area where a knife can become damaged with hard use over time is at the front of the handle nearest the blade. The solution to this was to add a metal bolster to protect the handle. There were a few other small considerations I’d noted down but above were the main ones. Some of my specifiations would be met by my design and some would come from Raven Armoury’s craftmanship. I have to admit I was taking my time, using different knives, taking note of what I did and didn’t like. By now it was May and Simon asked if he could have a preliminary sketch from which to make a plastic/wooden model. I scanned the sketch and emailed it to Simon. 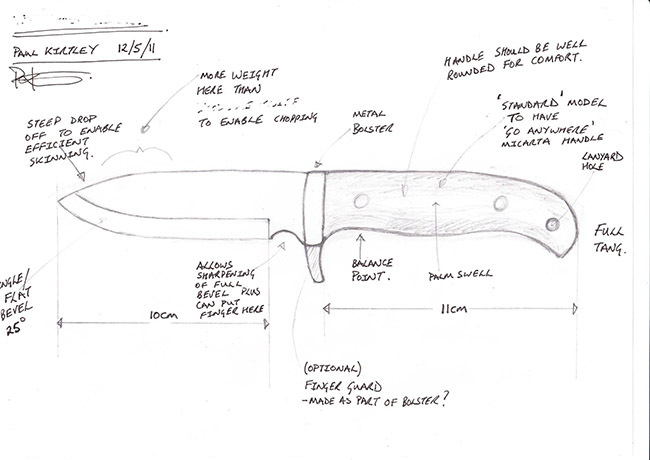 Three days later I had the model knife in my hands – what Simon called a “draft sketch”. Rather than make the model from wood or plastic, Simon and his team had produced an actual knife from spare materials they had in their workshop, albeit a simplified version of the design. It was fabricated from EN45 spring steel which Simon explained is a steel for swords but would do for a mock up of the knife. If this was their idea of a rough sketch, I was even more excited about getting to the finished product. Simon Fearnamm's idea of a "draft sketch". The Raven PK1 re-production Prototype MKI. Photo: Raven Armoury. Pins: 5.5mm Brass and 3mm Stainless Steel. Lanyard Hole: Brass 7mm ID. 8mm OD. Given the knife was a working model, I spent a weekend testing it on various bushcraft projects. I didn’t like the feel of the EN45 steel as it cut (there was a distinct lack of bite) and it lost its edge very quickly. I had to put this out of my mind, however, as the production knife would be made from O-1 tool steel with a hardness of 58-59 Rockwell. Aspects that needed changing were that the scales were too flat and the angle between the top of the scales and the side was too abrupt – this caused some discomfort in the web of my hand after a day of carving. There needed to be more of a palm swell too. Most significant was that the knife didn’t cut as well as I’d hoped on powerful cutting strokes. After some observation of the mechanics of this, I decided the angle between the edge of the blade and the centre-line of the handle needed to be decreased by 5 or so degrees. The deep choil proved to be unnecessary due to the success of the shape of the handle. My finger stayed securely behind the area of the bolster. 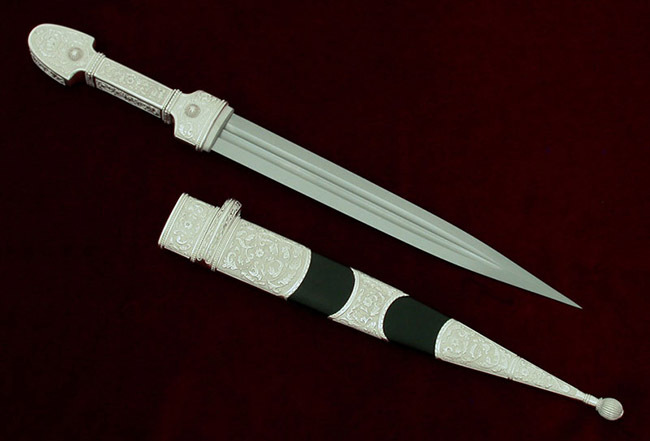 With my hand behind the bolster, the large choil meant the distance between my hand and the beginning of the sharpened edge of the blade was too large. I couldn’t transfer as much force into cutting as I would have liked. So the choil needed to be dramatically reduced in size and the edge brought closer to the grip. A small point was that the lanyard hole was too big but I knew this was due to Simon using the materials he had to hand. The next day I went to Simon’s workshop and we went through my proposed changes. 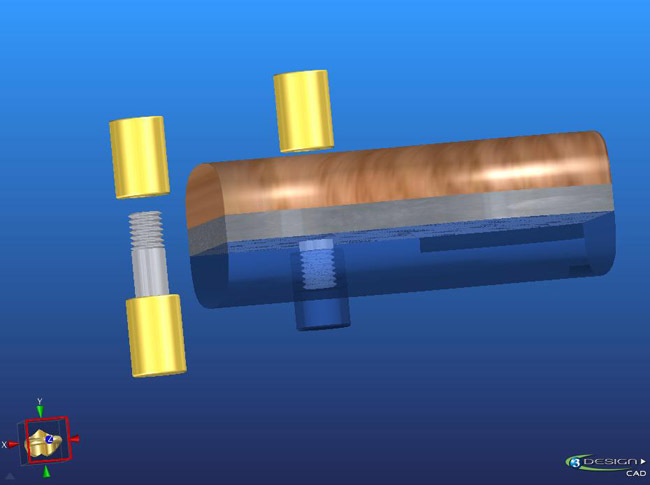 We also discussed the fittings that would be used on the final version. Simon's blind Loveless bolts improve function and give a completely flush finish with the handle scales. 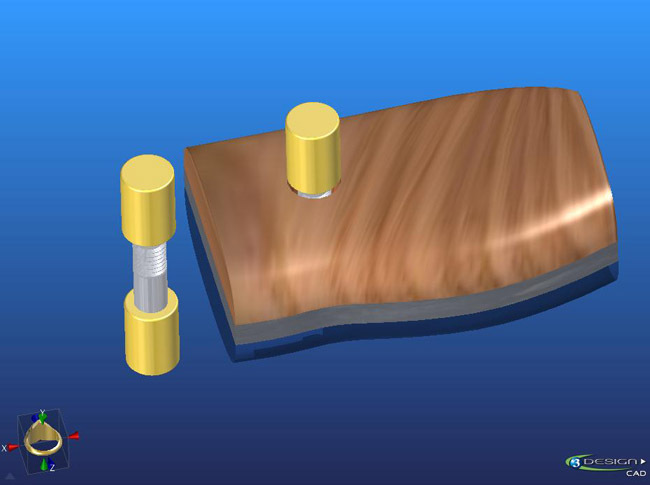 A second design view of the blind Loveless bolts used on Raven PK1 Knives. Simon and crew got to work straight away and within a week the Mk II pre-production prototype was delivered. This was finished with the black micarta scales and brass bolsters planned for the final version of the knife. The choil was reduced in size and now looked very neat. Due to this change and the reduction in angle of the edge relative to the handle, the shape of the knife looked a little odd I thought. But, on reflection, this was only compared to the bushcraft knives I was used to. The lanyard hole was still too large but despite this the knife looked really smart, really good quality. Raven PK1 Pre-production prototype MKII. Photo: Raven Armoury. I headed to the woods and tested the knife, paying particular attention to its ability to cut well on powerful cutting strokes. Even though the blade was still made from EN45, the change in blade angle made all the difference. In combination with the improvements to the handle shape, which made it very comfortable to use, the knife felt a much more potent tool than the MKI had. Despite the EN45 steel not having much bite and it already losing its edge, as a final test for the day I decided to make some feather sticks. The MkII knife made easy work of the task. The wide, flat bevel certainly helped with this. The comfort of the improved grip and the revised angle of the blade also contributed significantly to how sweet the knife felt to use for this job. Raven PK1 Pre-production prototype MKII and featherstick. Photo: Paul Kirtley. After this test outing there were only a few minor changes I wanted to make, such as chamfering the bolsters to make various hand positions for holding the knife more ergonomic. I came away from the woods eager to try this knife design in O-1 tool steel. It wasn’t long before I received the MKIII knife along with its custom-made leather sheath. The first of the prototype knives to be made from O-1 tool steel. The Raven PK1 pre-production prototype MKIII and sheath. Photo: Raven Armoury. Lanyard: Brass 5.5 mm ID. 6.5 mm OD. 1. Blade material and hardness. 3. Surface finish steel shot blast rather than sand blast on flattened areas. 4. Lanyard hole reduced in size. This was now the final “draft sketch”, and I was now to test this knife extensively. We were particularly interested to see how it performed in O-1 steel, how well it retained its edge and how easy it was to sharpen in the field and on bench stones. Also, we wanted to see how it fared cosmetically with more prolonged use in the field. Field testing the Raven PK1 pre-production prototype MKIII. Photos: Amanda Quaine. Whatever Simon has done to the steel has made it truly amazing. It takes a razor sharp edge and holds it longer than any other bushcraft knife I’ve used. Everything I used the knife for surpassed my expectations based on using the MKII knife. It cut green saplings like they weren’t there. It is a very good skinning and field butchery knife. The extra weight in the blade and the shape of the handle which allows a secure grip further back means that light to medium chopping with the knife is very effective. Batoning the 3/16″ blade thickness through rounds of wood was also a breeze. It makes great feathersticks. It carves well. With the O-1 steel and large bevel it generates very big sparks with a Swedish Firesteel. I could go on but I think you get the picture. Raven PK1 prototype being used while teaching small game preparation. Photo: Dusan Babic. I have used the knife on my own time and while teaching courses over the course of several months. The only issue I had with using the MkIII knife was that sheathing it was a little awkward if I didn’t get the blade and the sheath in the same plane. The blade then sometimes cut into the inside of the sheath. We have fixed this problem with re-shaping the sheath and creating a thicker welt. From top to bottom, the progression of Raven PK1 Knife sheaths. 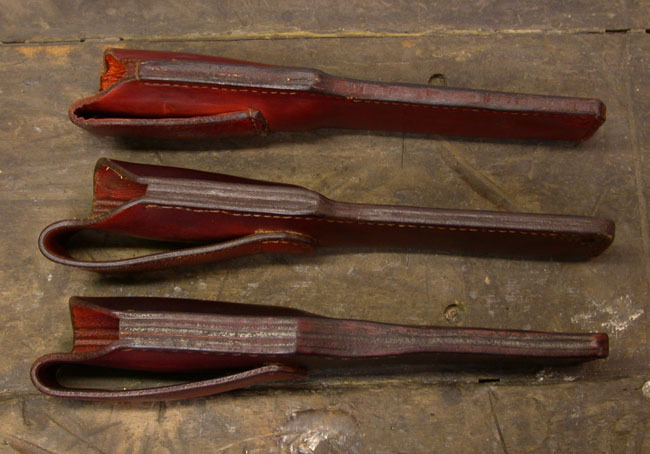 From 1st to 2nd - larger belt loop better construction; from 2nd to 3rd - significant reshaping, thicker leather and thicker welt. Photo: Raven Armoury. Now that I have tested the final pre-production prototype knife, Simon can move forward with production of these knives. The Raven PK1 pre-production run and production knives will bear the Raven Armoury logo. Photo: Raven Armoury. Initially Raven Armoury will be producing 12 production prototypes. These will be hand made to production standards and numbered P1 to P12. All pre-production and production knives will bear the Raven Armoury mark on one side of the blade and the model number, Frontier Bushcraft roundel and the designer’s signature on the other side. 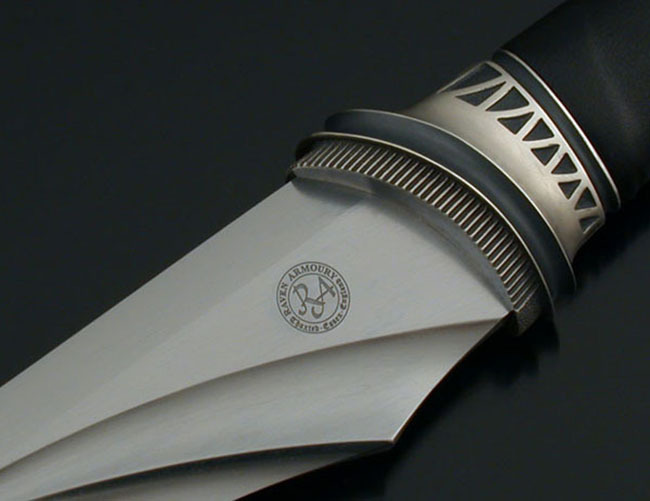 The Raven PK1 Knife with Frontier Bushcraft logo, model number and signature. Photo: Raven Armoury. Lanyard: Stainless Steel 5.5 mm ID. 6.5 mm OD. A thing of beauty. The blade of a Raven PK1 Knife in Damascus steel. Photo: Raven Armoury. Following this production prototype run of 13 knives, Simon will commence with production knives, numbered 001, 002, 003, … etc sequentially. As well as the ‘standard’ version as per the production prototypes 1-12, there will be various options available. 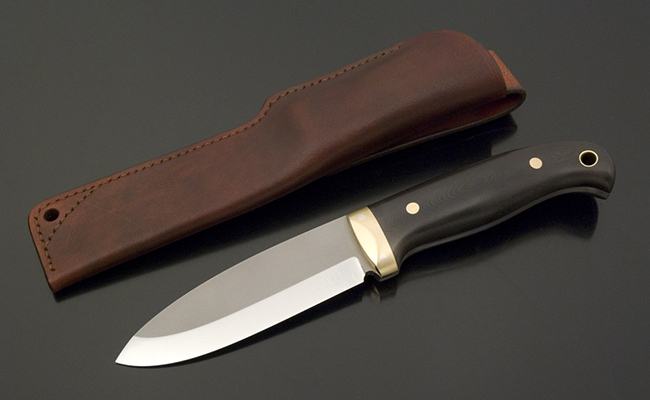 Simon is keen that his customers don’t feel that they are restricted to a “one-size-fits-all product”; these knives are hand made and can be produced longer, shorter, fatter or thinner. Raven Armoury are also offering the blades in different steels and a multitude of options for materials for both the grips and fittings. Some changes won’t affect the cost and some will, but Simon points out that it’s worth bearing in mind that custom work often adds a little time to production. Grip Size: Reduction, usually no extra cost but increased delivery time. Blade size: Reduction, usually no extra cost but increased delivery time. Grip Size: Increase, possibly slight extra cost and increased delivery time. Blade size: Increase, usually slight extra cost and increased delivery time. Simon is now taking orders for these knives. For further information and to contact Simon, visit the knives section of the Raven Armoury website. So far this has been an exciting and illuminating project to be involved with. I’m very much looking forward to seeing the results of customisations to my design and the beautiful objects that Simon and his team will create. Let us know in the comments section of this article which customisations you would make for function or aesthetics. All I can say is WOW, I want one! I’ve had my bushcraft knife for 3 years or so now and it comes in handy for all sorts of things but this is just something above that, better start saving my pennies. Wow. The knife looks beautiful. It does retain the ‘bushcrafty’ look but is noticeably different enough to reassure me it’s bringing something a bit different to the table. And the aesthetic is superb! I love the chamfer on the bolster. It looks beautiful but I can see how it’s also really practical; same with the roundness of the handle. A general point and not aimed specifically at you Dave but it’s worth mentioning here in response to your point about affordability – I was talking to Simon of Raven Armoury yesterday and he is looking at ways of possibly making the knife available via payments in monthly installments. Please speak to Simon for more details. In regards to the price, I wouldn’t suggest for a second that it is greater than the knife is worth. RA’s products look to be fantastically well made and there is obviously a wealth of your experience has gone into its making. In fact, considering what I just said the knife is no doubt great value for money! I did take it as a compliment 🙂 Your comment just reminded me of the conversation I had with Simon of Raven Armoury. I thought it was worth mentioning for general consumption. What an awesome project to be involved in – nice work Paul! I’m no expert on knives, but from a purely aesthetic perspective, it looks great! Hey Grant, good to hear from you mate. It has definitely been a great project to be involved with. As you know very well, seeing a product go from design to production is a very satisfying process. As said before wow the Raven PK1 looks wonderful. Here’s hoping I will be able to afford it when it gets released and the waiting list doesn’t run in to years like other knives. Thanks for your comment. Obviously I hope the knife is well-received and Simon takes plenty of orders. But yes it would be nice to avoid the 10-year waiting list problem…. Looks fantastic. Price would be a definite sticking point (for my wife) but I understand why the prive pointis what it is and think it fair. Fascinating description of the process Paul, thanks for sharing. The knife appears to have true practicality coupled with great aesthetics. You have picked up on some great new features. I use my trusty standard Woodlore maple handled knife on almost a daily basis. It has proven to be pretty bomb proof and suits me well. I find the handle comfortable, weight and balance very good , it holds an edge well and is easy to sharpen . But in my humble opinion,it could do with a deeper bevel with the angle of the bevel reduced somewhat. I find it far easier to use thinner bladed knives to carve, even Moras and Opinels. The angle of the bevel on my Woodlore appears to offer greater resistance especially when doing slightly more delicate work. Despite my ‘attachment’ to my Woodlores. I think the PK could be an attractive proposition. For that money – I would need to get to grips with one first , to make sure it really suited me. Thank you for your usual logical and in depth approach. With respect to getting to grips with a PK1, I understand that Simon will be keeping a few versions of the knives in the Raven Armoury showroom so that people can drop by and size them up. I really like the knife! But won’t the bolster freaze to your hands? Just out of curiosity, how about stick tang knives? or can you just not balance that? Thanks for commenting. Will the bolster freeze to your hands? Well the metal of the tang is exposed between the scales of the handle anyway. I avoid touching any metal with bare hands in sub-zero temperatures. As for stick-tang or needle-tang knives, yes if they are well-made they are very good. This type of knife of course forms the classic knife of northern Scandinavia. The large Sami knives tend to have a blade thickness of 3-4mm and these function very well. Why did we choose a full-tang for the PK1? Just for outright strength. A beauty Paul, I realy mean that, but far, far too much money for a knife IMHO ! I guess we all have our personal ceiling and I know that there are more expensive knives out there ( I work and the Knife show in Bristol every year and as such have seen the cream of what this country has to offer and a fair bit from our friends around the world. ) Not one of my 4 Alan Wood knives have cost as much as the Raven, altho many of Alans can ! To some up, do I love it ? Yes ! Would I like one ? Yes ! Would I by one ? No. Great article Paul, realy very good , a fasinating read. Hi Chris, thanks for your comment. It is a lovely knife, very well made. But as you say it will be out of some people’s price bracket. That’s not to say they can’t afford it, just that it isn’t in their make-up to spend such an amount on a single knife, particularly if they want to actually use the knife. I completely understand this. I bought my first Alan Wood Woodlore back in 2001 for £150 and even back then there are some who would not have paid this. What was important to both Simon and I on this project was that we do as good a job of it as we could. And I think we have done it justice. I know Simon has priced it as keenly as he can. It makes me glad to hear that you love the knife, regardless of the selling price. It makes me happy that you like the design and appreciate the effort that goes into fabricating each knife. Thanks for your kind comments and it’s good to hear you also enjoyed reading the article about the creation of the Raven PK1. So sorry about the stupid spelling mistakes ! Lovely knives and those dudes who make em make quality kit. Good luck with the sales. p.s. got one of them pesky trout! a little bute. It’s not quite a sandwich worth but it’ll fill the gap in one of my fillings and it’s going in my birthday sarnie regardless, with a healthy dose of wood sorrel picked slap bang next to the pool wee ‘burt’ the brown trout as ive named him(haha) came out of. Oh and some juicy blaes. Not as good as your canadian beer soaked fish but i’ll wash it down with a cold one to make up for it. yum yum and yummy. haha. you’ll have to run that recipe by me so i can have a pop. would be muchas appreciated. Mate, the fact that you don’t sit on fences is very refreshing. I’m a Yorkshireman and I appreciate straight-talking. Like I said in the article, we’ve been using edged tools for thousands of years and I was never going to come up with something vastly different from what has gone before. But what I could do is assemble a group of features in a design that works for me. Could I use other knives? Of course; and I have done for many years. Ultimately it’s skills and knowledge that count most. The little Moras are great for the money and I hope, for those that are willing to purchase a PK1, they will also think it is a great knife for the money (whether they want it for the mantle piece or to use for years in the woods). I bought my Alan Wood back in 2001 when the price was £150. According to the RPI it ought to cost £199.17 if I bought it new now, but it is listed at £450. Supply and demand I guess. It has had some hard use and has had to put up with my amateur attempts at sharpening it. I even took it to an expert sharpener of Japanese knives but sadly he put a second bevel on it which I then later had to grind out. I put my own small choil in it with a chainsaw file a few years back because of the difficulty of sharpening all the way along the blade. It looks a shadow of its former self now, but I love it. Your knife if beautiful and I feel there is very much a place for beauty alongside functionality. It deserves to sell well. Thanks for your supportive comments. I’m glad you like the aesthetics of the knife. It’s good to hear about the longevity of your Alan Wood knife. I also bought mine in 2001. With 10 years of use and sharpening, it has lost a lot of metal and now looks more like a stiletto. This was the first knife that really allowed me to appreciate the value of a good quality hand-made knife. When you have travelled far and wide with such a knife as your companion, then it becomes your friend. You could put it in a line-up of other similar knives and you’d always pick it out. Such old friends as these become invaluable. I know from conversations I’ve had with Simon at Raven Armoury that he fully intends these knives to be so well-made, they will last a lifetime. That is one seriously lovely knife Paul… shame you didn’t bring one of the protypes with you to RC to tempt us even more. Well I’m sorry to put you in such a quandary 🙂 You’ll just have to ponder that decision…. I would have brought a prototype to RC but the sheaths were back with Simon at Raven Armoury. I’ll bring a PK1 along next time. The logo looks lovely. A good price for a piece of immaculate british craftsmanship. Ian, it is indeed a top logo. I hear that people are already copying it and making shirt patterns that include it…. Very very nice Paul. Starting the design is always the hardest part. Luckily you had a great maker to work with which makes the whole process far less exhausting. There is something really special and satisfying about using a knife you designed yourself. Unfortunately a custom design by a skilled knifemaker does cost alot of money and really can’t be compared to a mass produced factory item. Most people are perfectly happy with the excellent Mora and other knives, but like furniture and other personal items, some people also like something a little bit special that will become a treasured item over the years and through use. 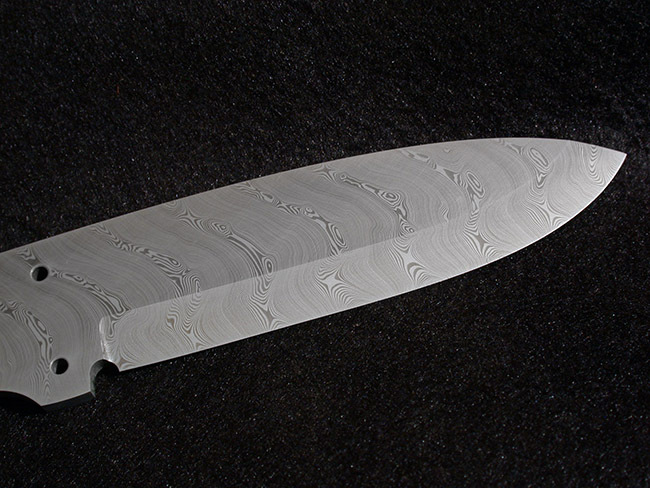 I also really appreciate the skill it takes for a knifemaker to apply a grind and shape a knife freehand. In a country which has lost many of its once prevelant trades and crafts, it is comforting to know we still have a very healthy and thriving hand made knife and cutlery making industry. Some of which go back generations. 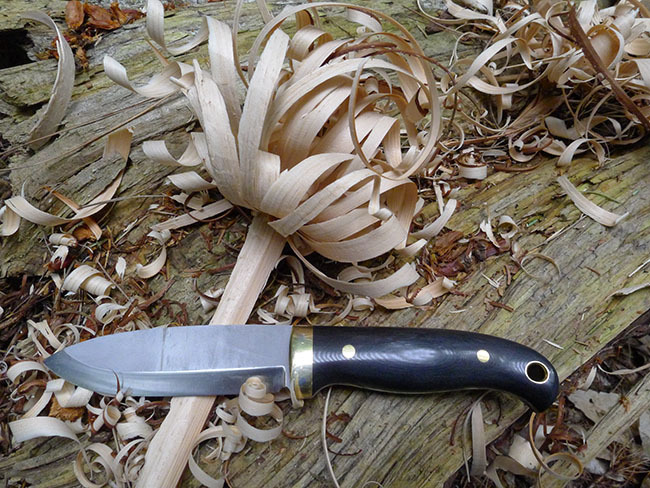 The growing popularity and awareness of bushcraft has seen many new knifemakers come onto the scene recently. It is a great tradition that we really should support, and it is great to see this industry grow once more. It’s good to see you back here after an absence of some time. I hope you’ve been filling it with finding interesting serpents? I’m also flattered that you like the design as I know that knife design/making is something close to your heart. I was indeed very lucky to be working with such an accomplished maker. The quality of his and his colleagues work is quite amazing. Everything is done by hand/eye. I agree that little Mora knives are very good. But I also believe that in this day and age of mass production and easy-come, easy-go throwaway consumerism, that we should still embrace traditional skills and craftsmanship. Particulary if the items produced will last a long time. It’s interesting that many people are prepared to pay hundreds of pounds per day for the time or a lawyer or IT consultant but to pay £300 -400 for the time of a skilled craftsman is looked upon in a different light. I for one am very excited to see such a thriving knife-making community, producing not only items that are very funcional but very beautiful too. Yeah, I have been really busy his year and the British herping season is soon coming to a close… then on to Tanzania/Kenya. I have loads of catching up reading to do. Your Wilky review looks very interesting. I always craved that knife too back in the 80’s. Back to the PK1, the Bjorkman Twist is a great pattern damasteel. I got a knife made up with it and it looks stunning. Looking forward to seeing that one finished. 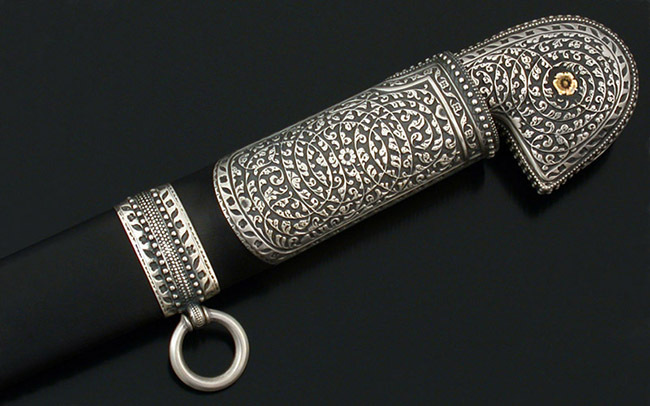 JD, I’m also very much looking forward to seeing the finished knife in Bjorkman Twist Damascus. It should be gorgeous. I’ll likely showcase this and other customer’s variations on this blog over time, if people are interested. Whereabouts in Tanzania/Kenya are you off to? I’m off to the forests of the Kakamega area looking for Jameson’s mamba. As you know, I love Africa, I always feel I’m going home when I start my journey. It is a very special place. It also hosts all of my favourite species of snake. It’s a great looking knife and possibly a precision instrument but it has a huge price tag. I’ve been using a sog sealpup for the last 7 years and at less than one sixth the price its never let me down. Good to hear from you. I hear what you are saying, and it’s certainly true that factory-produced knives will be less expensive. 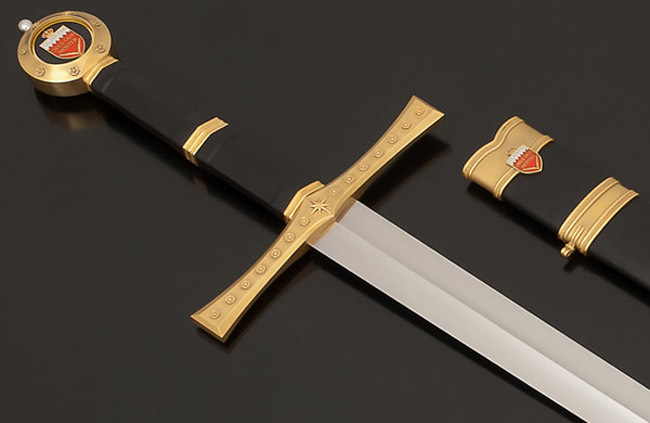 Raven Armoury, however, are in the business of hand-crafting swords and knives to a very high standard of craftmanship. It’s also worth highlighting that because the the PK1 is a hand-made knife, it is not a one-size-fits-all product. If you want the handle with more or less palm swell, a blade that is narrower, a different handle material, etc, Raven Armoury will do it for you. This is the beauty of what is essentially a hand-made bespoke product. Suits on Saville Row will always cost more than off-the-peg products. It’s the nature of a product that requires a lot of man-hours and does not benefit from the economies of scale of mass production. Some people want to spend thousands on a bespoke suit, others are happy with an off the peg suit for much. much less. The same goes for shotguns – some people want a very basic model, some people want a Beretta Silver Pigeon and others want something by Purdey. The knife looks great and looking through the RA website it obviously come from a good linage but i cant say much more than that without playing with one, with regards to the price, I do wonder if people forget that you can save up for something that you want, I know it doesn’t fill the need feelings right away but it is much more satisfying when you don’t have any shady feeling when your new toy arrives, I have already deposited the first £10 into my savings account, in the hope I can stay the course to buy one! The choil shape on the PK1 does indeed work very well for sharpening (and saving the edges of your stones!). Placed my order today! Very excited about this knife and can’t wait to try it out. 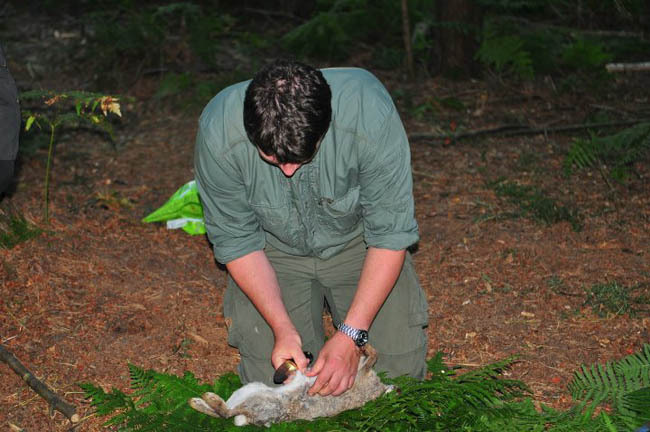 Now I just need you to teach a frontier bushcraft course in the US so I can take one! Fantastic! Great to hear from you. I’m sure you’ll be very pleased with your knife – I’m still very excited about the MkIII prototype that I have and I’ve been using it for some time now. It’s a great tool with fantastic looks too. Please keep us up-to-date with how you are getting on with it, what adventures you’ve taken it on, etc. WOW!!! That is one Beautiful Knife!!! And what a fantastic experience it must be to not only be able to design your own knife but also be able to test and modify it as you go along. Looking at the finished article it looks to me like you are onto a winner there, tested at each stage of the design and with the obviously high standard of Raven Armourys craftmanship it should certainly be a tool to be reckoned with. That is another entry on my wish list! It was the testing and modification part of the developement process that made it really valuable for me. Iterating through versions where you test ideas is a sure way to know if they work or not. Some of the ideas worked, some of them didn’t. The end result is a very effective tool. Raven Armoury’s standards are the highest I’ve seen. I very much hope that my design in combination with their standards of quality make it a successful product for them. Nice knive design, very stylish besides the functionality, and a good functional sheeth. I am currently using an Enzo Trapper O1 scandi. But would love to use your knive in action one time. Do you have any comparising ? Perhaps a YouTube presentation/review ? There aren’t any YouTube or similar yet but maybe we’ll do that. Good idea! Enzo make some good knives and very good value. Did you make it up from a kit or buy it ready-made? No bought just it ready to use. Very pleased with the Enzo so far. Making a knife myself is for the near future, my design was already made a few years ago though. It was very similiar to yours, besides a flat steel plate at the end of the handle. Never took it into production. Very classy looking bushcraftknive, well worth the money I think. But with this price to be honest I would not dare to use it. It stays in a nice closet. Thanks for your comment. Keep in touch. I received my PK1 limited custom made knife a few days ago, and i have to say it is a work of art. it should be exhibited in a museum of Bushcraft knives… Its design is superb, the wieght and balance is pure brilliance. It was a present from my WIfe Cheryl and daughter Eva (2yrs and 9 months and already her favourite past time is going in the woods with Daddy). This knife was little more that the normal because I had a few little cosmetics put on my knife but well worth it. A REAL GEM that has now become a family heirloom I LOVE IT. Simon at Raven Armoury is a perfectionist to say the least, a real pleasant man to deal with and I have actually made an arrangement to go and see him next time I am in the area. Thank you Paul and thank you Simon. Good Work as always, keep it up. Firstly, thankyou! i’ve been a huge fan of the Raven Armoury for years but could never justify spending thousands of pounds on a sword to hang on the wall, although I’ve come close a couple of times!!! I have now found the perfect excuse to purchase my own Raven Armoury piece, the PK1. I spoke to Simon and am going for a visit to finalise the finer points of my knife at the begining of June. However, whilst speaking to Simon he said that he recently produced for you a stainless version of the PK1 on which he achieved a very similar hardness to the O1 carbon steel version and that you currenlty have the stainless version on test. I was just wondering if you have had it long enough to give us your views? I am not normally a great fan of stainless knives as i struggle to keep an edge on them for very long, however, with the guys at Raven producing this knife I was wondering if this one was different??? Thanks for getting in touch. I don’t think you’ll be disappointed – the quality of workmanship that Simon and his team deliver is stunning. I have recently received a PK1 in RWL34 stainless steel and I’m in the process of giving it a thorough field test. I’ve only had it a few weeks and therefore am only willing to say that my first impression of the knife is that it is very good. There are many tasks for which I have yet to use the knife, however, so I will reserve judgement until I’ve been a lot more extensive in my testing of the blade. In due course I will write up my findings into an article for this blog. Thanks for your interest in the PK1. I’m very very happy with the design. I’ve been using the O1 blade for nearly a year now and it’s proving to be an excellent bush knife. If I can answer any other questions about the design or my experience with the materials thus far, please don’t hesitate to ask. i got my RWL34 PK1 about a year ago now and i have to say its excellent, i’ve used it for all manner of tasks and it excels in all of them. It keeps its edge brilliantly, (relatively) easy to sharpen, and field dressing of game it’s amazing to name but a few of its properties. I’ve thanked Simon and his team, (and accidentally ordered a sword!!) so now my thanks to you also for a brilliant knife. It’s good to hear from you and kind of you to take the time to offer your feedback on your PK1. I’m very glad it is serving you well in a broad range of tasks and I hope it continues to be your faithful companion for years to come. You are comparing a photo of the third prototype with the specifications/dimensions of the production knives. They are different. I would like to purchase a RavenPk1. I wrote a Email to Raven Armoury and to your frontier Bushcraft. But i have recieved no awnser till now. I just wanted to ask if the knife is still availeble? How long would I have to wait approx.? Thanks for your message, and your interest in the PK1. There is currently a waiting list for PK1 orders. I will get in touch with Simon at Raven for an update on exactly how long. could you please let me know also. Amanda tried to call you today. She’s sent you an email. I hope you received it. We’ll give you a buzz again in the coming days. no email yet. Tried to call back a couple of times after missed call but no reply. Thanks again for your help, i know your a busy guy. Amanda is out til Wednesday. I’ll try to give you a call in the next day or so. How are you and is there any update from Raven Armoury on supplies of the PK1. Ps did you manage to find the mushroom powder ok? Is there any new Information on the availebility on the standard PK1 ? Got no awnser from Raven Armoury yet and no other information can me found. Hi paul, well done, indeed a very nice looking knife.! The blade is the perfect size&shape but i’m a traditionalist, all wood handle with 2x 3-4mm brass pins & a brass lanyard hole, kind of guy,and i’m not a fan of the brass quillon or finger guard or any kind of choil. I agree with dave, can’t beat a mora for quality&build strength vs cost. I once got caught out/stuck between high rising rivers in heavy rain in New Zealand. Late in the day I bivi’d out with hammock and tent fly over like a tarp. Next day I was able to make it to the hut i was aiming for but arrived properly cold and wet, almost hypothermic. No amount of goretex could have helped ;0) ..! Lucky for me there was a bit of dry firewood but only big logs, an old rusty saw and no axe.! I battened the hell out of my mora (frost clipper) knife, it underwent the most rigourous test it could have that day, didn’t bend or break and I still have it.!! Amazing..! That’s a beautiful knife, Paul! Im impressed by its evolution and the application of your criteria. I really live it when something can be created to be both practical and beautiful. I wanted to know, did you ever consider having the handle carved for ‘handedness’, in pursuit of extra usability? Best wishes, and I love your blogs! Thanks for your comments. I’m glad you found this post interesting. To answer your question – no I hadn’t considered any modifications to make it right or left handed.